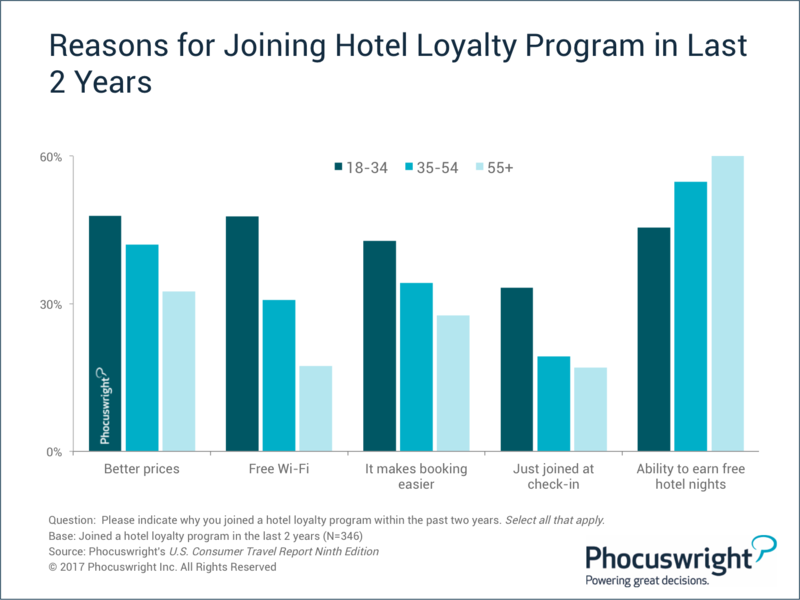 How Loyal are Hotel Loyalty Members? Loyal travelers are undoubtedly a highly coveted group of customers for travel suppliers. Not only are they frequent travelers, they also spend a great deal on their trips each year and, most importantly, they book direct. The recent loyalty program push by many hotel chains is working in suppliers' favor; half of U.S. leisure travelers now belong to a hotel loyalty program, up 10% from 2014 (pre-loyalty push). This membership rate is higher than both the air and OTA segments. From room upgrades and members-only rates to free Wi-Fi and breakfast, hotels continue to offer up perks intended to boost direct bookings. However, loyalty participation doesn't equate to loyal customers. More and more travelers are joining multiple programs to reap on-the-spot benefits, and not necessarily to be faithful to the brand. 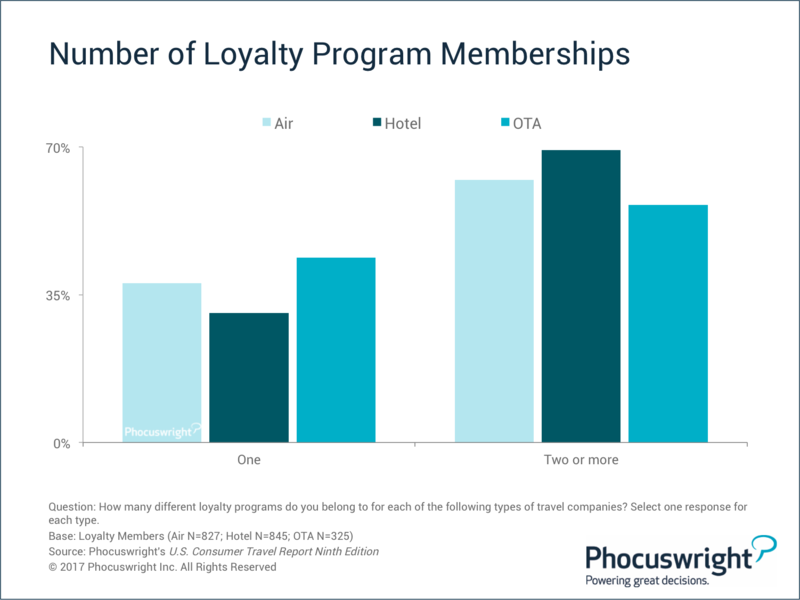 Seven in 10 hotel loyalty members participate in multiple programs – the most fickle (read: not-so-loyal) of loyalty travelers. And millennials may be the most fickle of all. Three in five 18- to 34-year-olds who are hotel loyalty members joined the program in the past two years, compared to just two in five travelers overall. Loyalty initiatives geared toward younger travelers are a key strategy for hotels. But millennials – more than anyone – are in it for the incentives. Younger travelers are most likely to join a program on an impromptu basis at check-in, perhaps for better prices or free Wi-Fi. Older travelers, conversely, join primarily to earn their way to free hotel nights – or in other words, a truer form of loyal behavior. Check out more consumer loyalty analysis and have a complete look at U.S. leisure traveler behavior in Phocuswright's U.S. Consumer Travel Report Ninth Edition. This report is immediately available for Phocuswright Research Global Edition subscribers. Learn more about becoming a subscriber. Come hear hospitality experts from Duetto, Wyndham, Hotel Tonight and Hotelbeds hash out some of the biggest topics facing the industry – including loyalty programs, direct booking, AI and Airbnb – during the Accommodation Upended roundtable session at The Phocuswright Conference in Ft. Lauderdale/Hollywood, Florida, November 7-9. Save $200 through Friday, November 3 (only a few tickets left at this price! ).